Wedding cakes have been a wedding tradition for a very long time. Brides and groom spend countless hours looking for the perfect baker, the perfect taste, and the perfect decoration look for their wedding day. Thus it is a stand alone piece of resistance and art at every reception. Children in particular and many adults love deserts and a wedding cake is what your family and friends look forward to on your wedding day. Often times the day goes by so quickly that your guest always remembers the beautiful rich flavor and taste of your wedding cake. Every baker puts a tremendous amount of time into not only mixing and tasting delicious but also making a wedding cake a work of art. Every wedding as a theme and for this wedding, the bride and groom chose a more rustic route with flowers and a wedding cake topper with a silver accent with their new last name and the wedding date. As a wedding photographer in Charleston, SC I always want to make very sure that I produce a very compelling image for pretty much anything I photograph. If you think about it the Baker has created to piece of art, your clients as maybe a mock-up photo of what their cake will look like, but we wedding photographers are the ones as image maker and storyteller that must produce an image that represents all of this. I captured this amazing image at Harbour Club, here in Charleston, SC. I put lots of artistry and thought as to the representation of my client's wedding cake. 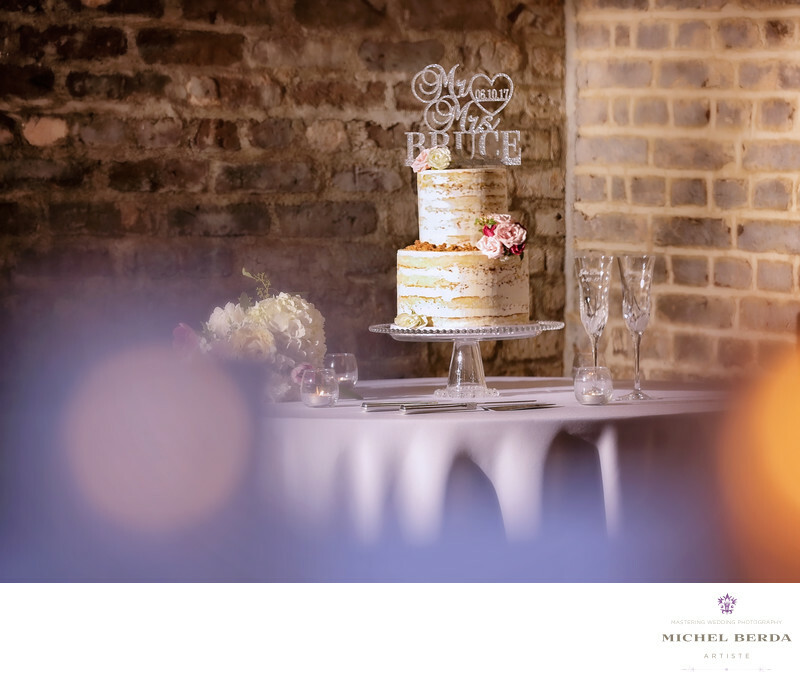 This wedding cake image breathes a rustic feel and I love the charm and elegance in this wedding cake image.Keywords: Charleston (1179), Charleston SC wedding cake (3), Charleston Wedding Photographer (24), harbour club (12), harbour club wedding (9), Michel Berda (1140), photographer (1125), wedding cake (3), wedding cake Charleston SC (3), Wedding Photographer (1254), wedding photographer Charleston (9), wedding photographer harbour club (9), Wedding photographer Harbour Club Charleston (3).